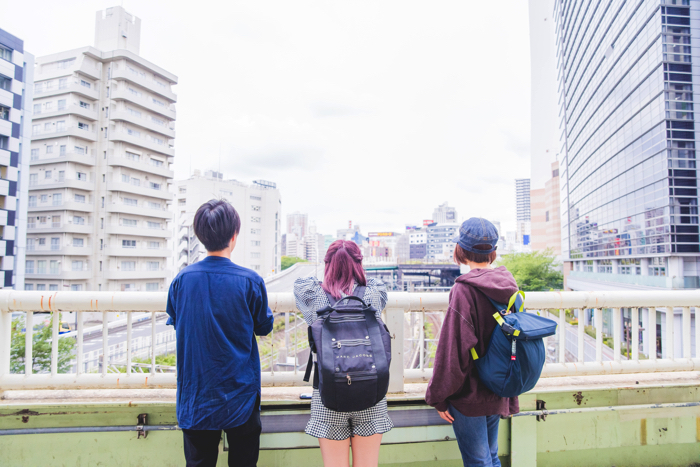 Anna Yano is a full-blown anime freak, and this feature lets her feed that passion as she visit real life locations of her favourite anime series. 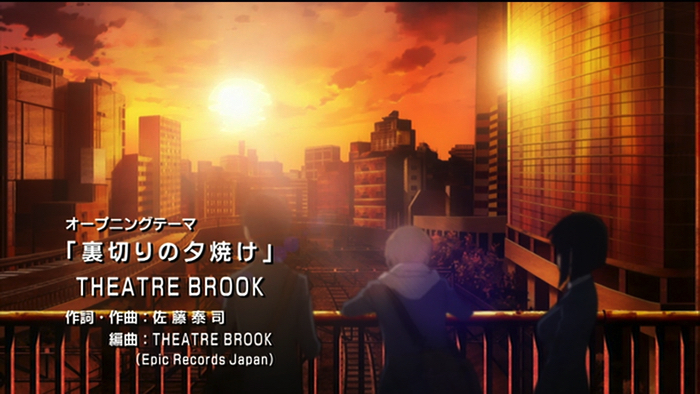 The location for this second entry was Ikebukuro. 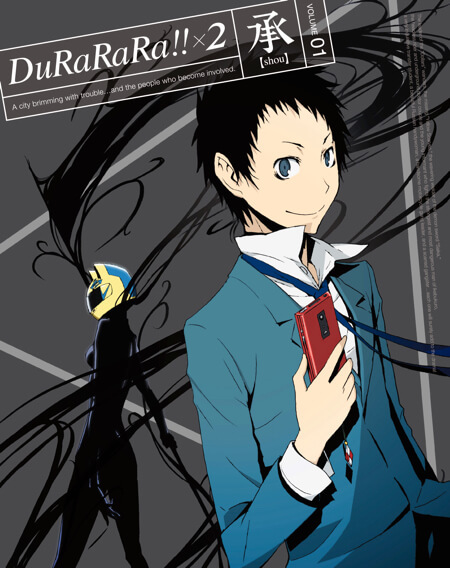 When people think of Ikebukuro, there’s no other series that springs to mind quite like Durarara!! 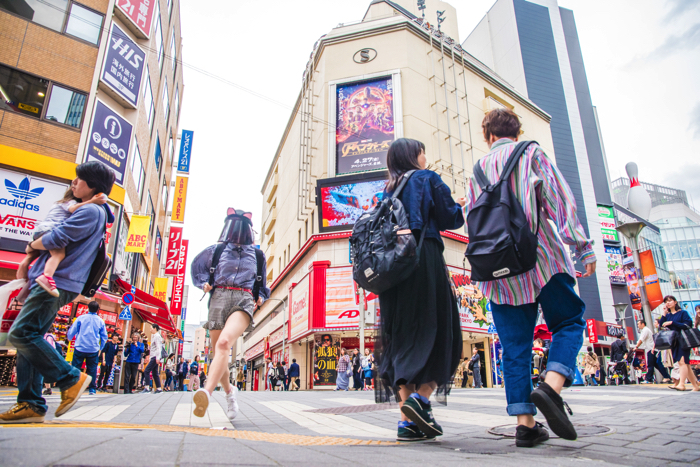 The opening video of the anime is immensely popular amongst fans for how cool it is, so Anna challenged herself to recreating it with help from people on the street who love Ikebukuro! We begin in front of Tokyu Hands. What kind of pose is this all of a sudden, lifting your phone up in the air like that?! This is actually the place where the Dollars first met in the show. 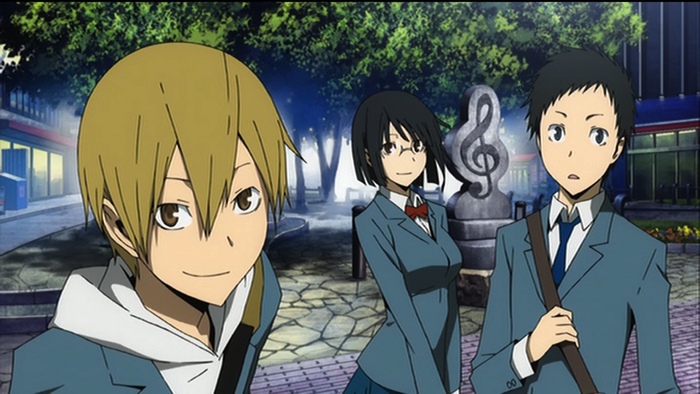 It’s when Mikado Ryugamine called his pals on his mobile and found out most of the people he knew were members. First up, this place! The music note monument along Sunshine Street. 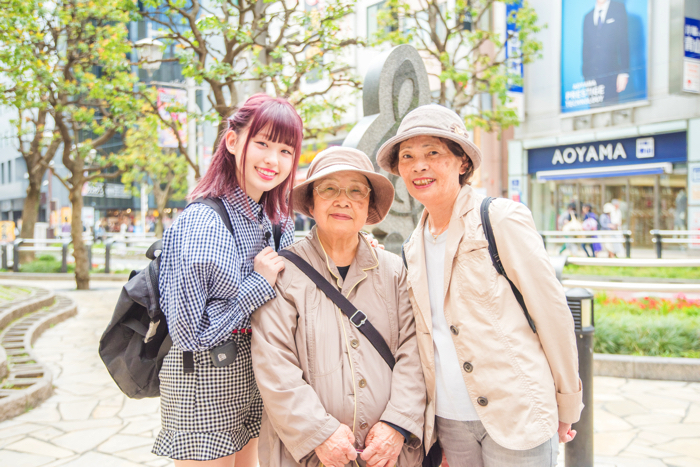 Anna called over two cute ladies who were in the middle of shopping in Ikebukuro. This is the best photo ever with everyone lined up in the same order – from the right Mikado Ryugamine, then Anri Sonohara, and finally Anna as Masaomi Kida! Anna gave a gleaming smile as she said, “I wanted to try coming here!” Everything’s going great from the get go. Thank you, ladies! 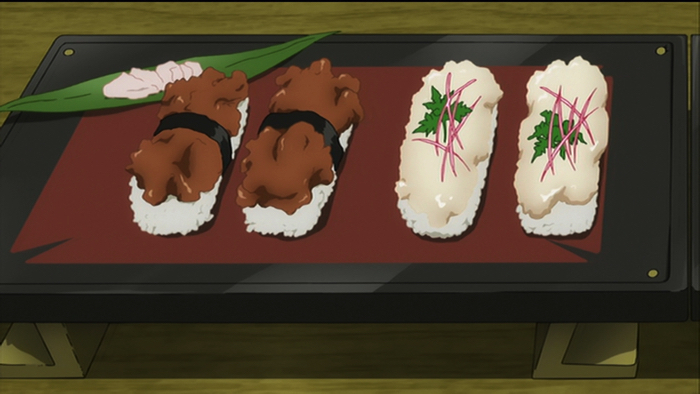 Moving on to the next scene, we have Russia Sushi which appears in the anime. 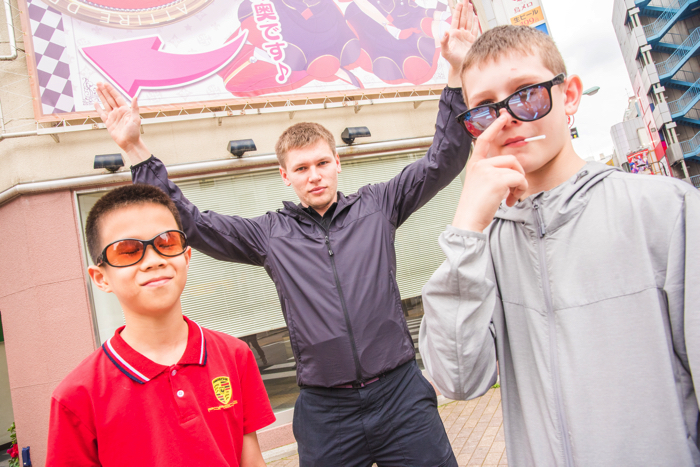 Anna caught a nice guy who had come from Russia to visit Japan. “What a miracle to meet someone Russian in front of Russia Sushi!” The anime gods must be smiling at Anna right now. 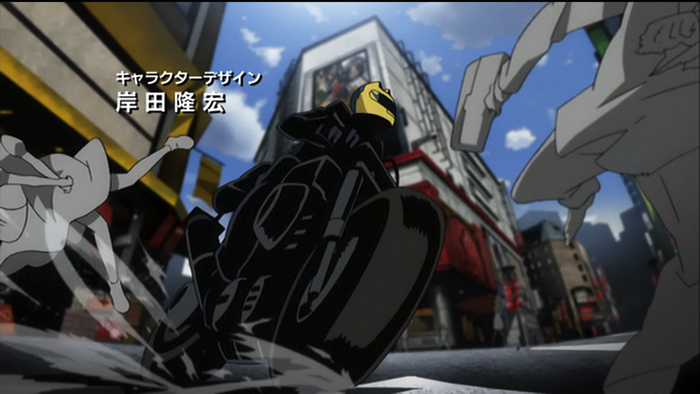 Next, the scene where the The Headless Rider rides her bike in front of Cinema Sunshine. Anna too ran with all her might! Getting drenched in front of Aoyama. Anna is stretching her body. The sky faded into twilight at Mutsumata Bridge with the the orange coloured setting sun. 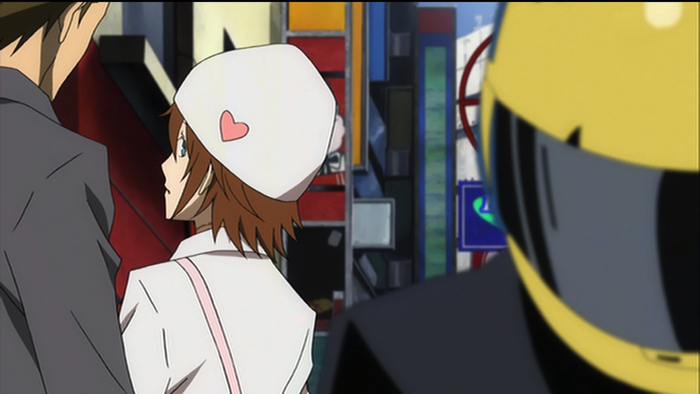 Be sure to check Anna’s version of the Durarara!! opening video on Kawaii JAPAN-da!! on MBS. 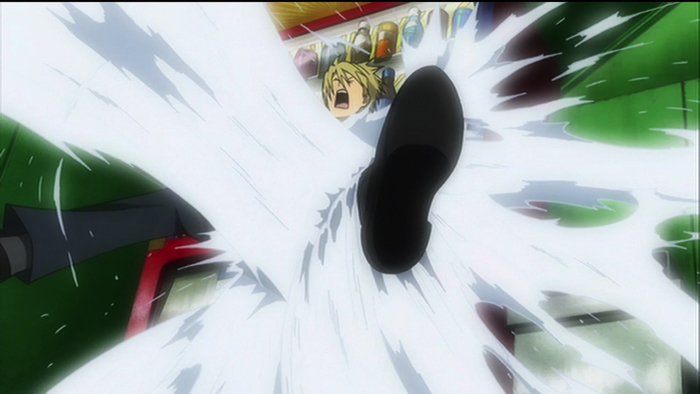 Next on the list is the food portion of the scenes. 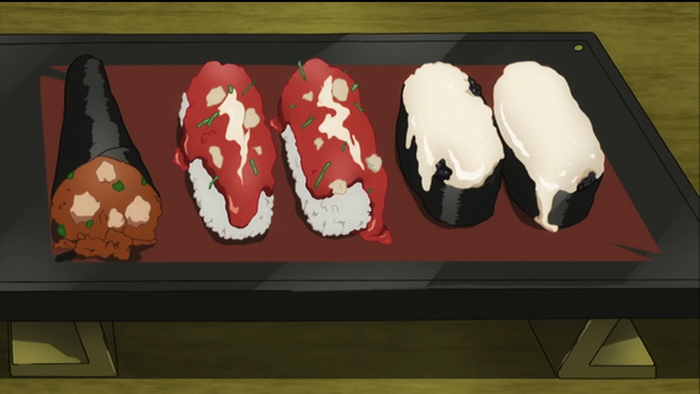 Anna was able to ask the staff to recreate the sushi they eat in the anime at Russia Sushi, a type of Edomae Sushi. 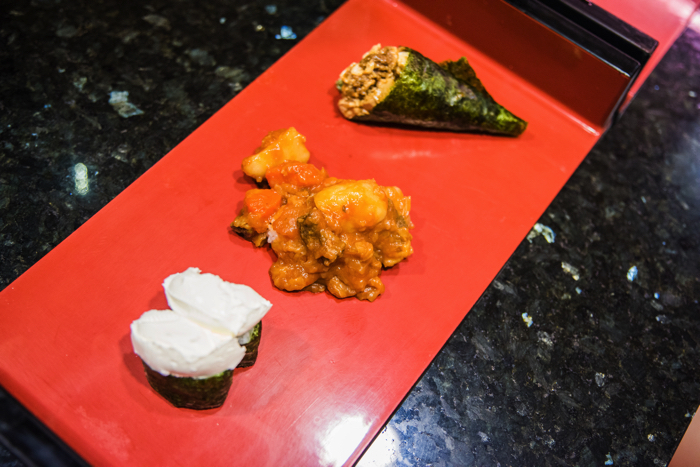 From the left: sour cream, borscht, and mapo! 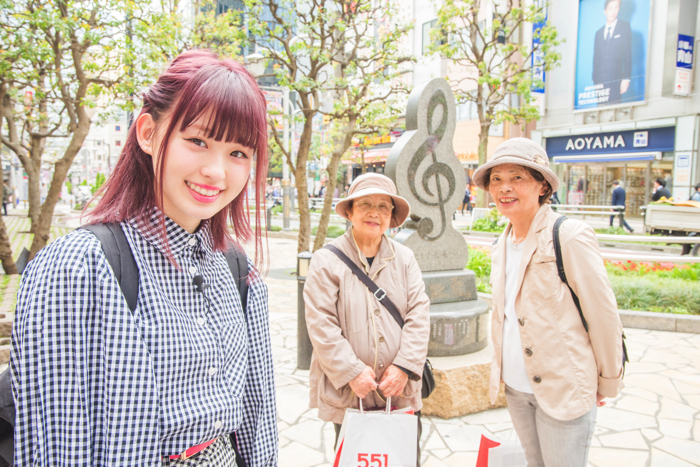 After filling her stomach, Anna left Ikebukuro to go to another certain place. 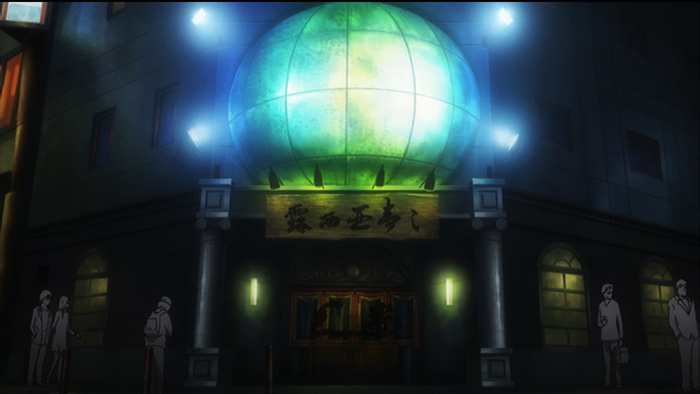 Smile Cafe Roots was used as a model for a place that appears in the anime. 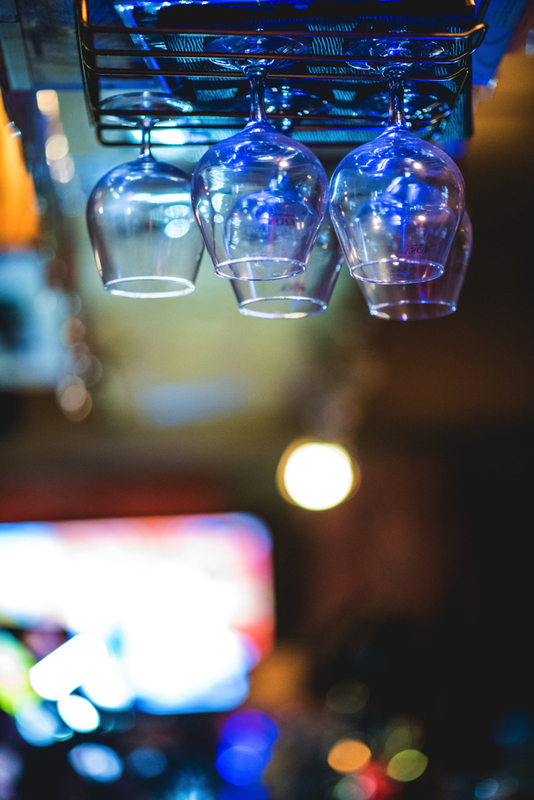 It’s a bar in Higashi-Nakano. She was also able to get a cocktail like the one from the show. 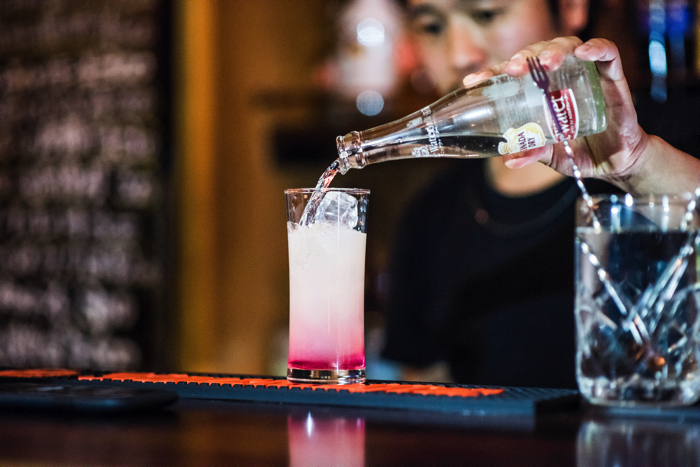 Anna was in a world of her own as she drank the cocktail of her beloved Shizuo. 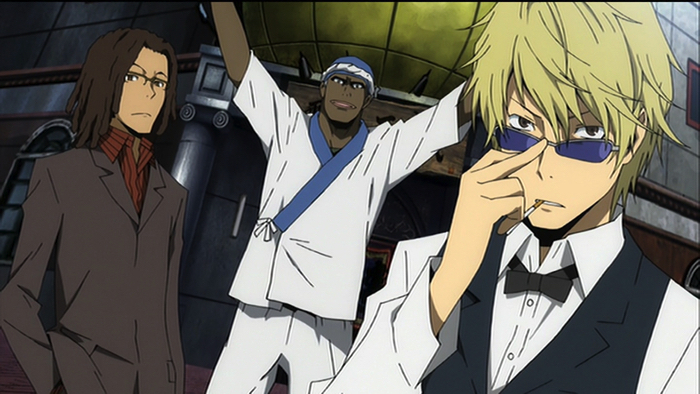 After her getting a little intoxicated, we asked Anna about the appeal of Durarara!! once more. 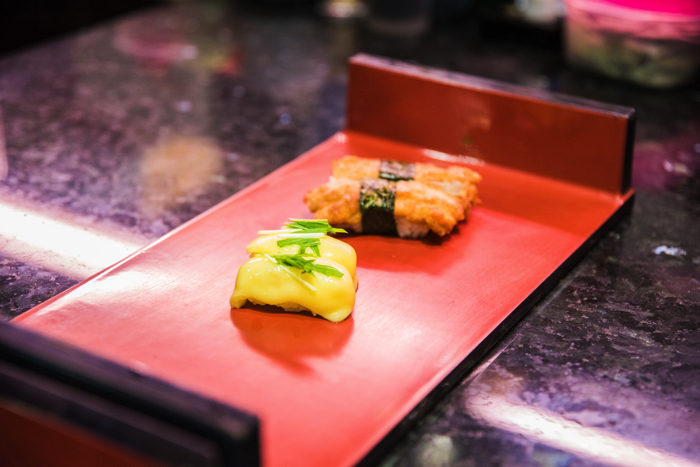 【LA Dinner】Even if you don’t like a raw fish, don’t worry – you can still enjoy SUSHI at “CASA ARIGATO” in LA!